James Wellbeloved Dog Adult Pouches are a complete wet food for dogs that’s easily digestible and soothes itchy and irritated skin. 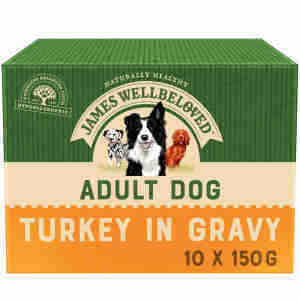 James Wellbeloved Dog Adult Pouches is a wholesome, hypoallergenic wet food. Made without using beef, pork, wheat, gluten, dairy or soya, it helps to reduce your pet’s contact with ingredients that are a common cause of intolerance in dogs, thus reducing their symptoms. This formula is made with one type of animal protein, making it delicate on your dog’s digestive system. By cutting out chicken, beef and pork, which are known to cause irritation in dogs with ingredient sensitivities, you can limit your dog's exposure to allergens. High digestibility is essential for your dog to absorb nutrients. This wet food uses carbohydrates from rice and vegetables that are easy to digest, meaning your pet gets the maximum amount of nutrition and vitamins from every mouthful. Wellbeloved Adult Pouches care for your dog inside as well as out. A combination of alfalfa, seaweed and linseed helps to soothe your dog’s skin, which can become irritated due to intolerance. You'll soon notice their skin becomes less itchy and their coat becomes shiny. doesn’t include beef, pork, wheat, gluten, dairy or soya – helping to cut out ingredients that are a common source of irritation. James Wellbeloved Adult Pouches contain all the nutrients and vitamins your adult dog needs without the ingredients that are most likely to cause irritation. If you think your dog might be suffering from food sensitivity, talk to your vet. They may recommend changing your dog's diet to one such as this. This hypoallergenic formula can be used as a daily food for all dogs, including those who are sensitive to ingredients or nutrients. Feed your dog this wet food alone or use on top of James Wellbeloved dry mix as part of a balanced diet. Typical analysis: Protein 5. 5%, oil 4. 5%, ash 1. 2%, fibre 0. 5%, moisture 82%. Typical analysis: Protein 6. 5%, oil 4. 0%, ash 1. 5%, fibre 0. 5%, moisture 81%. Got the James Wellbeloved pouches for my elderly dog and she loves them mixed with dry food. Always happy with Medicanimal. Have been getting James Well beloved pouches for a few years. I mix them with dry food and my Sheltie loves them. Also add that it is an amazingly fast service. Thank you. My dog loves all the food purchased here. Also it is a very fast delivery which is great particularly if I am running out. Would not buy elsewhere. Been having my Wellbeloved products for quite a long time and buying from this site have to say the delivery time is excellent. Thank you.